I don’t know about you, but most of the recipes we cook at home start with onions and garlic in the pan with a little olive oil. We cook most nights of the week, so that means we use a lot of onions throughout the year. That’s why they’re one of my favorite vegetables to grow in my garden. I usually plant between 300-500 (mostly storage) onions so we can eat them all winter long. A fun goal I set for myself is to never have to buy onions at the store. I’ve mastered the art of growing onions in my own garden over the last 10 years. My onion harvest is pretty amazing each July. But, a lot of gardeners tell me they struggle to grow onions successfully. If that’s true for you, too, it’s probably because you aren’t familiar with the most important tips and tricks to growing great onions. In this post, I hope the change that for you! 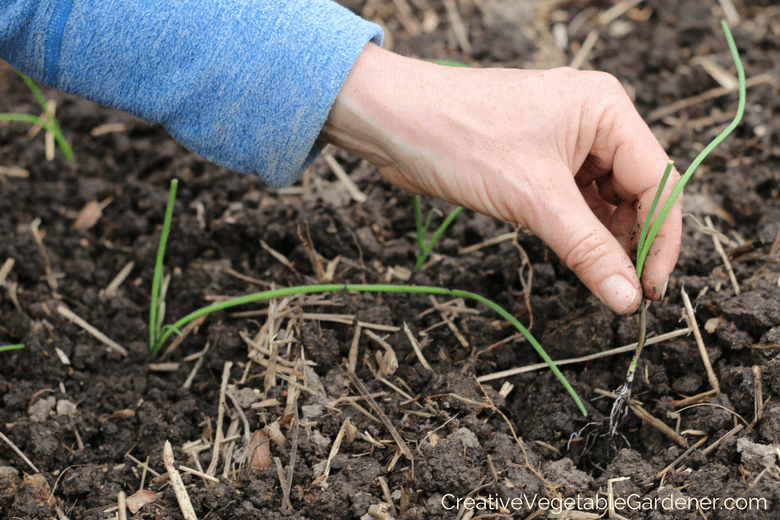 I’m sharing the most important things you need to do when you’re out in your garden planting onions this spring. If you’re having trouble with your onions growing into a nice big bulb, it could be because you’re planting them too late. The amount of daylight your garden gets during onion growing season will dictate when they start forming a bulb. In northern gardens, because we have long days of sunlight, we plant long day onions that start forming a bulb when the days are 14-16 hours long. Short day onions are best for southern gardens. They’ll start bulbing when the daylength is 10-12 hours. Why does this matter? In my garden in zone 5a (Wisconsin) my onions start growing bulbs around the summer solstice. The amount and size of the green leaves on the plant at that time will help determine the size of the bulb I harvest in July. If you plant too late in spring, the onions won’t have time to grow enough green leaves to encourage large bulbs. You should plant your onions about four weeks before your average last frost. Depending on the weather, I usually plant my onions the third week in April. Don’t plant onion seeds directly into the ground in spring. They won’t have time to turn into bulbs. If you didn’t start onion seeds at home you’ll need to buy onion transplants or sets. Transplants are seeds that were started a few months ago inside a greenhouse. Sets are immature bulbs that were grown last year. Choose transplants if you have the option. Sets are more likely to bolt, or put up a flower, since they were started the previous year. I’ve gotten the best results by growing my own onion plants, so consider putting them on your seed starting list for this year if there’s time. The first step is to know whether the variety is long, intermediate, or short day so you can make sure it’s right for your latitude. The second step is to think about when you want to use your onions. Do you want to eat them in the near future? Or do you want to store them long term so you can use them in favorite recipes all winter long? If you want to keep your onions for many months you should choose a storage variety. There are three colors of onions – red, white, and yellow. The differences between the colors are more connected to the varieties than the actual color. Some store better than others, some are mild, and some more potent. I encourage you to plant a mixture of different colors and varieties so you can find your favorites. As for my garden, I start my own onion seeds. I always grow Ailsa Craig, a huge mild onion, for fresh eating, short-term storage, and to use in making salsa for canning. My favorite yellow onion for storage is Patterson , and I’ve been planting Redwing, my all-time favorite red storage onion, for many, many years. My husband prepping the onion bed in our community garden plot. I’ve never tilled my garden in 17 years and I don’t recommend it because it destroys the soil structure over time. The best way to lay out your garden is to have a permanent design of beds and paths. This makes spring prep a breeze! I don’t dig, flip, or disturb my soil much. I use a hard rake to loosen up the top few inches of soil before planting onions and seeds. I always mix in a balanced organic fertilizer with the rake as well. Onions can be planted pretty close together – six inches on all sides. This means you’ll be able to fit a lot of onions in a small space. I usually fit my 400 or so onions in two to three garden beds. We use a handmade dibbler that has prongs spaced six inches apart. It creates our holes for us so all we have to do is place the transplant into the hole and cover it with soil. Check out this video on when to harvest your onions and how to cure them for winter storage. 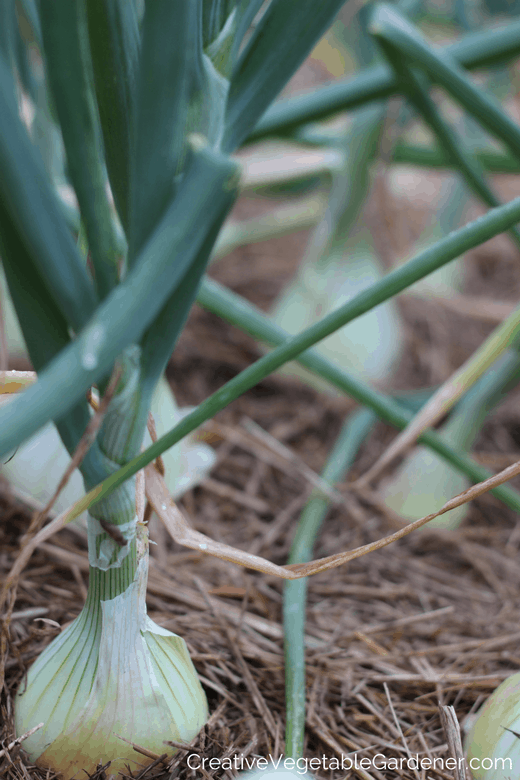 The two practices most important to successfully growing onions are weeding and watering. Onions don’t compete well with weeds. It’s best to get them mulched as soon as possible after planting. It’s difficult to mulch small transplants, so I wait a couple of weeks until they get bigger and then mulch with a layer of marsh hay. You can also use straw, grass clippings, or leaves. Onions love water, so you must make sure they get one inch of water per week. I keep track of the weekly rainfall with my rain gauge. If we don’t receive one inch of rain during a particular week I water my onions very deeply. 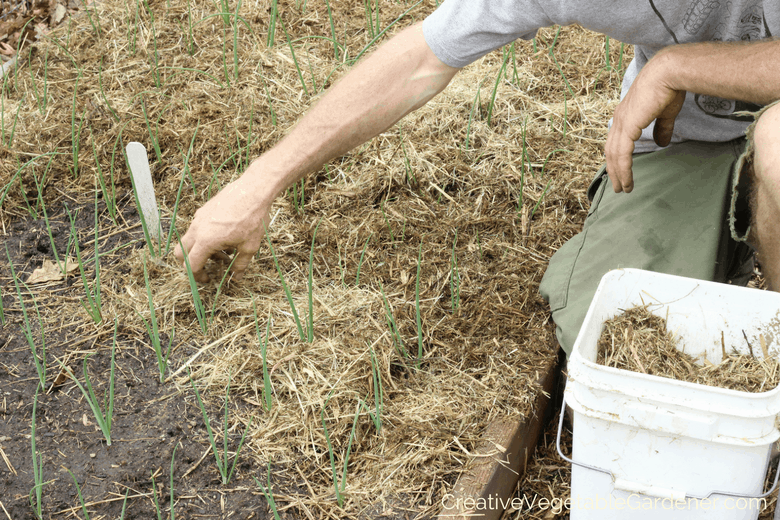 Mulch your onions with hay to keep down the weeds and trap in moisture. Onions are a great addition to your vegetable garden, especially if you like to cook a lot at home. Don’t be discouraged if you’ve had a lack of success in the past. If you incorporate these six tips into your onion planting and growing routine this season you should have a much more successful crop!. Want to read more about growing tricky vegetables? I know you say that you place your onion plants 6 inches apart, but your dibble looks to have points 4 inches apart as I figure out by placing my hand on a ruler like yours on the dibble. Do you place onions 4 inches apart in rows that are 6 inches apart? …or is your hand just much larger than mine? I like the dibble and want to make one, just brought up short by this inconsistency. 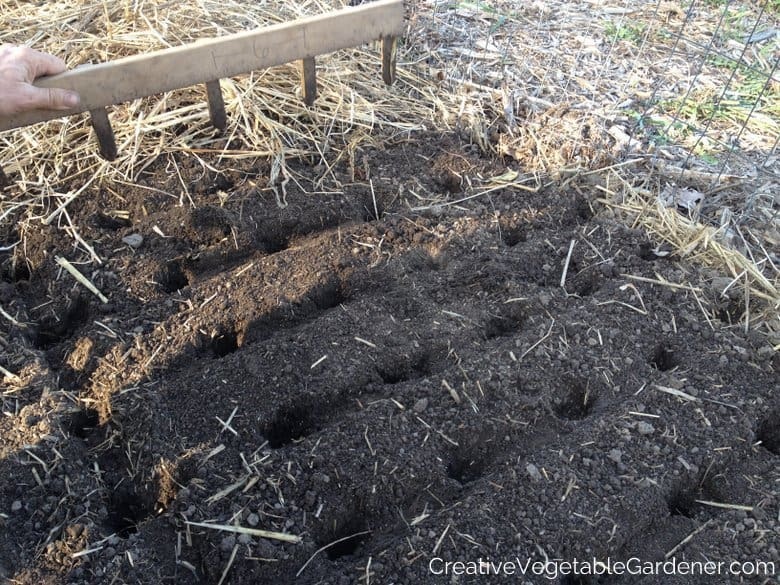 Do you have any suggestions for growing in a raised bed, using the square foot gardening method. I want to add onions to my garden for the first time. Hi Louise- I don’t use the Square Foot Gardening method in my garden, so I’d suggest getting the book which explains all the details. I can tell you that onions should be planted about 6 inches apart on all sides. Good luck! I’m just starting to garden, so I apologize if my questions seem silly. Are transplants just seeds you started in a sunny window in Feb? And, are green onions just ones that are harvested before the form a bulb? Hi Brianna- Yes, transplants are seeds either your or a farmer started in the winter. I don’t recommend growing your seedlings in front of a window because they need overhead light. If you want to grow green onions you’ll get the best results by buying seed meant for this purpose. Hi Megan, I was wondering what type of hay you use for mulching? Thanks for your great blog! Hi Penny – Thanks for reading! I use marsh hay. Be careful of your source. Make sure you’re not buying from someone who hayed a weedy field. Oat straw will work well most of the time, too. The oats may sprout but they usually die pretty quickly. Hi, I would like to know how to tell my onions are ready to harvest and do you ever grow garlic in the same soils as your onions or with your onions I should say? I live in Mississippi so of course we have a warmer climate and a lot of spring rain. Thank you..
Hi Tamara- Your onions are ready to harvest when the greens flop over. I wait until this happens to the entire bed. I grow garlic in a different bed since I plant it in the fall. I don’t plant my onions until April. What do you mean exactly “harvest when the greens flop over”? The whole plant? So what about when the flower bud stem curls? Daphne- You shouldn’t have any flowers on first year onions. If you do, it’s probably because you’ve planted onion sets. They’re technically second year onions, so they sometimes go to flower. I’ve had the best luck growing my own onions from seed. When I do that I don’t get any flowers and all of the green leaves flop over when it’s time to harvest. How do you store your onions after harvest? How long are your dibbler stakes? Great question – about 5 inches! Hi! I’m new to most gardening (especially veggies!) I was wondering how do you keep or store your onions since you grow so many? Thanks for your posts!! I have started my seeds in 3″ peat pots. Will I need to remove them from the pots and put them in bigger pots? They are broccoli, cabbage and cauliflower for now. Tomatoes and peppers plus squash later. Zone five and I started them on February 22, 17. Thank you for your reply. Hi John- It depends on what quality soil you used. If you see them starting to turn yellow you might need to replace the soil, although you don’t necessarily need to give them more room. I grow my brassicas in 4 packs or 6 packs, which are pretty small container sizes. I wonder if dried bracken could be used to mulsh onions in place of marsh or oat straw? Hi Sylvia- I don’t see why not. Plenty of people use dried leave for mulching. Try it out and let me know how it goes! How big are the prongs on your dribbler, ( width ) and how deep do you plant your onions. Thanks !! Width is about half an inch. I plant my onions a few inches deep. I like to get them down into the soil and make sure all of the white and some of the green is covered up. It’s fine to plant them deep. I have trouble getting large onions. Most are medium to small. A few will be large. What would be keeping me from getting large onions. Schere- Are you using your own plants or buying from a nursery? Keeping them weeded and watered are two big things you can do. I also have better luck with growing my own seeds at home or buying transplants. Do I have to worry about root maggots and if yes how do I deal with not getting them. I read wood ash works?? That would be an interesting experiment, RaNae. Thanks for sharing! Thanks for your information on fall gardening and onions I found it very helpful! I did something different with my onions this year. I used onion sets as opposed to seeds. What a big mistake. My onions were a disaster this year. I know a lot of people love starting from sets, but for me I’ll stick with the seeds. I do far better. Mike- I agree! I’ve used both and I get much better onions when starting my own seeds. Not all experiments turn out well in the garden, but we always learn something from them! I bought sets to use as companion plants and I started several hundred seed a few months ago. When the sets start to grow a flower can I pull and eat them? Also, if I let them flower, can I save the seeds to start more next year? I really enjoy learning from all of you on here. Thanks for sharing. I grew up in Vidalia onion country, and live on the Georgia coast, so I feel like it’s a near-sin to not grow onions! 😀 I’m new to gardening and put my first batch of yellows in the ground last fall. We are coming up on harvest season and I can’t wait! I use onions in nearly every dish, and I just wish there was a way to store them longterm in zone 9A. I have yet to come across a solid plan other than chopping/freezing. This is a great article. I have never been overly successful with onions. We live on the Canadian border in a little town deemed “the icebox of the nation ” it is mid April and it is still snowing and dipping below 0*. I am actually planning on building a greenhouse so I can be more versatile in my plant selection. Any recommendations on an onion that may be a good beginners onion. Our soil will be frozen solid and covered in snow for about 3 more weeks. Than once the snow is gone it takes a while till I can work the soil because our frost goes down 5-8 ft depending on the snow pack and severity of the winter. I typically plant in the garden in the first 2 weeks of June. I plant a lot of my plants in pots and drag them in and out of the heated garage every day until mid June. Can I grow a decent onion in a large pot? I would LOVE to never buy another onion but am daunted! Thank you so much for the advice! We just put in raised garden boxes and I’m looking forward to having a garden. I’ve always been intimidated at the thought of growing onions, but your advice has made me think I will give it a try! Some told me not to water too much because my onion rot with moist soil.